Niue is an island country in the South Pacific Ocean, 2,400 kilometres northeast of New Zealand, east of Tonga, south of Samoa, and west of the Cook Islands. Niue’s population is predominantly Polynesian.The island is commonly referred to as “The Rock”, which comes from the traditional name “Rock of Polynesia”. 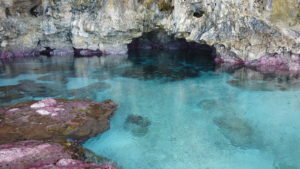 Niue is one of the world’s largest coral islands. The terrain of the island has two noticeable levels. The higher level is made up of a limestone cliff running along the coast, with a plateau in the centre of the island reaching approximately 60 metres (200 feet) high above sea level. The lower level is a coastal terrace approximately 0.5 km (0.3 miles) wide and about 25–27 metres (80–90 feet) high, which slopes down and meets the sea in small cliffs. A coral reef surrounds the island, with the only major break in the reef being in the central western coast, close to the capital, Alofi. The choice of this period for my activities from the Pacific falls for three simple reasons: it is the end of the rainy season and my 1/2ʎ antennas work better if the ground is wet, my birthday at the end of March and the WPX SSB contest that I always find fascinating. After a careful evaluation, the first choice had fallen on Vanuatu but soon, after the announcement of Stan LZ1GC announced to his upcoming activities by Samoa and Vanuatu, forced me to look elsewhere. Niue is still a relatively reliable island on the most wanted (when I made the decision it was #72 general and #14 in 40EU) even though almost every year someone activates it more or less seriously. Just in October 2018 a New Zealand team was active from the island with a total log of 15.000qso. Niue is a self-governing state in free association with New Zealand; and New Zealand conducts most diplomatic relations—though not all—on its behalf. Niue is a bilingual country, with 30% of the population speaking both Niuean and English. My analysis of the island has therefore had to consider various factors among which also the gaps left by the various teams or individual operators in the past activities. First you need the license, without obtaining that you can not start. Thus began an endless and tiring exchange of emails with the Ministry of telecommunications. As often happens in places so remote and far from the way we handle events, you write an email and wait; spend the days and weeks and do not understand if your email has been received, read, if it will have a following, but in the meantime time passes and those 10/11 months that separate you at the next start are reduced with an impressive speed. Then finally the first answer, then the form to fill out and the amount to be cleared; from here to the final time it was only a matter of time but at least the engine had been started and I could devote myself to looking for a solution to stay overnight. The first choice fell on a single house just outside Alofi, the capital of the island, facing the sea in the direction of Asia, Japan and Europe via North Pole but an incorrect move by the owner of the house has questioned me if confirm the reservation. So I started to evaluate past activities and I happened to run into an artery written by Nob, JF2MBF and Ken, JA2FJP which among other things I had just connected from New Caledonia several times. 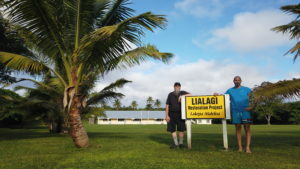 It will be him to show me the ocation chosen for his activity by Niue in 2016: Lakepa village. 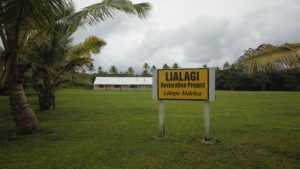 Lakepa is a village, which is also a municipality and electoral district, on the island of Niue, in the Pacific Ocean. The village is located on the northeastern coast, in the historical tribal region of Motu. It has a population of 51 inhabitants. Evaluating the two possibilities I have no doubts: Alofi has an almost strictly rocky bottom while Lakepa is land; Alofi has a good path to Asia and Europe but completely opposite the island to North America while Lakepa has open path to all three of the revolutions .. and then in Lakepa I would have available almost 3000 square meters of lawn for antennas albeit at 1000m from the sea where I can easily roll out a 110m BOGs. So start to make contact with the family that runs the structure, they will prove extremely kind and helpful and all at half the price of the first house viewed. I then began to refine the setup by evaluating the solution that could guarantee the highest number of QSOs as a single operator. If when it comes to contest the most obvious solution is SO2R, I thought I would develop my setup in that direction with a SO2Stations station. 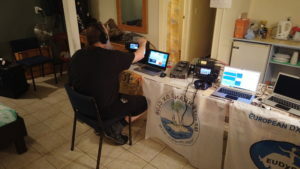 My setup, which accompanies me and will accompany the activities from the South Pacific in the coming years, consists of two IC-7300, two 30A power supplies (in addition to a spare 50A), two laptops, band pass filters and PA. The two stations are complementary to each other, each piece can be interchanged and the radio/pc configurations are identical and assigned to backup on volatile memories. One station will be devoted to the purely digital activities while the second to mixed activities (SSB, CW, DIGI), while at night or in the moments where I will need a psycho-physical recovery will be switched both in DIGI. As for the antennas, the less cumbersome and heavy solution that allows me to find the right band-time combinations is as follows: a mast supports three single-quad quads (6,12,15m) with three single descents, a vertical 10mh works 1/2ʎ on bands 17/20m (ideal solution with very wet ground, low irradiation angolol and yield like a monoband yagi), an 18mh spiderbeam mast with LC system at the base for 30.40,60, 160m (on Top Band it works as a inverted L) and finally one or two 110m BOGs for JA/EU and NA whose feeding will exploit the coax that in the daytime hours use for the quads. The tests on antennas and setup follow one another during the periods free from work from August to February, ending on 10 February 2019 with the last antenna tested and working. The same day I close the suitcases (kindly sponsored by the company GT Line – Explorercases) and I perform the last check-list check. It’s 6pm on March 16th when I arrive at Milan (Italy) airport, a couple of days spent with my family before leaving. A few ritual photos, a brief stop at the Emirates check-in desk to load the extra 55kg of material, in addition to the 10kg of my backpack, and then the routine checks. Tim NL8F is already waiting for me in Auckland where I hope he can clear-up the doubt by posting to the New Zealand airline about the excessive weight of the baggage; in total we pass the 110kg in addition to backpacks. The flight to Dubai passes quickly and, just at the airport, contact Tim who gives me his newly purchased New Zealand number, so it will be easier to keep in touch from here on my arrival. 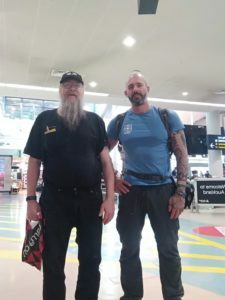 Upon arrival in Auckland, after solving some customs procedures, I meet Tim who is waiting for me at the arrivals terminal; store your luggage at the Temporary Storage and head to the hotel in the city center. 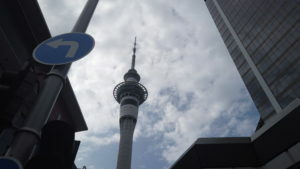 You can’t miss the visit to the Sky Tower in the Auckland Bay to see the city from 280m asl of the panoramic terrace where we take some photos. At 3:30am the alarm clock is waiting for us to be at the airport at 4:30am and to immediately carry out check-in procedures for the 110kg of luggage, arriving later would incur the restrictions of an excessive load and not having the opportunity to move everything on the island so it is better to eat something comfortably at the hotel restaurant and go to sleep at least the remaining few hours. At 9:30am the little A320 takes off from Auckland to Niue, just over 3 hours of flight and we will finally arrive. To date we have been traveling for over 3 days to reach this small island with a setup not really “holiday-style”. 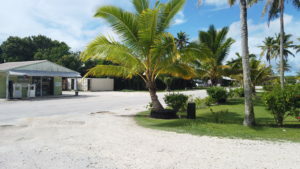 We arrive in Niue at 13 and after a brief stop at Alofi to activate a wi-fi contract and at the market to buy some food for the first few days we are at the destination. We immediately discover some damage suffered during the transport of the baggage: in the cw key of Tim is completely destroyed and the variable tuner of the vertical tuner 17/20m almost disassembled by vibrations. We then decide to raise up the quad 10/15m immediately and put the first station on-air. The first QSO is with JH1HLC and then the pileup starts immediately. By evening all the antennas are arranged and we are active with three stations, two main and one of support and backup. 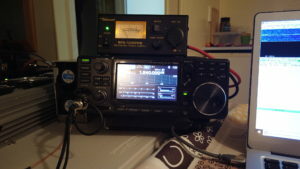 The days follow one after the other like the QSOs, with a constancy of about 1000 QSO/day; the central hours of the day, from 11am to 4pm are usually characterized by a total closure of all the bands; I often try to work in CW or RTTY but we never have such a feedback as in FT8 this is not because of a difference in interest or signal intensity .. it seems rather that our correspondents are so lazy that they prefer to let the computer work rather than the hands or head and this does not deny me very demoralized. Unfortunately on our return we will have to look at the numbers and this means that the operators from home to set the rules, so we adapt to this new way that really has little of “human” and that takes away much from the spirit of the DXpedition; only Japanese operators follow us everywhere in any way we operate. Worthy of note for quality, duration and intensity are the openings on the highest bands, especially in 12m while the 160m where more difficult than expected even the faithful inverted-L fails to make a difference. After a little more than a week, stupidly, I burn my PA: as soon as I wake up at 5am for my turn on the radio, with Tim who was closing the 160m with Europe, I don’t do the usual double-check and send to 100W full on RTTY in the amplifier, so the first amplifier smokes. Yes, because the second leaves us not many days later. It is late afternoon when we wake up from a few hours of rest done during the usual phase of closing the bands, I find the computers rebooted and I immediately suspect a problem occurred to the electricity network during our sleep (it is not rare to see the bulbs vary by intensity, the island’s electricity grid is managed by a large oil-fired generator), so Tim with just the press of the ST.by/Op button literally explodes the KPA-500 and we are thus with two PA burned and reduced to a Low -Power forced. Thus the possibility of the 160m fades, despite everything we try but 100w are really too few. Good satisfaction is also given by the 80m towards Europe in the evening and 40m in the morning. Approximately 5 days after the end of the activity we decide to remove the 110m beverage that we had placed directly to the north and that ended up in the dense vegetation of the forest discovering that someone had stolen the termination picket by tearing the wire (we still have to figure out who but we suspect some children of the village intrigued by the strange object). 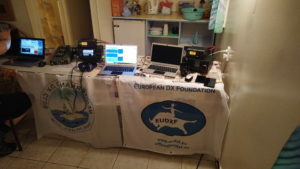 Many EU log stations, with a total of over 140 DXCC activities completed while the QSO counter stops at 4.420 with the last AH6TC station logged in 40m immediately before turning off the last radio. Really incredible some signals in 80m coming to S5, EA8, UT, DL and SV, like were local stations. We close all the bags and bring back our 110kg total of equipment, I am returning to Europe and Tim to Alaska, unlike me he will stop first in Australia by his sister taking the opportunity for another short activity from a VK island. Until next time and thanks again to all those who have called us, we hope to have made you enjoy at least half of what we enjoyed ourselves.